Cat Pumps began in the high pressure cleaning industry and it remains a core peice of our business today. Our cleaning products can be found in a variety of applications worldwide. 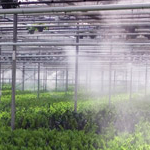 Cat Pumps offers a complete line of compact brass and stainless steel pumps and accessories for a variety of misting, fogging, cooling and humidity control applications. Cat Pumps can be found in a variety of applications in the Gas & Oilfield markets including washdown, chemical injection, oil transfer, wastewater re-injection and more. Construction and associated industries place high demands on the plant and machinery used in your work due to the arduous working conditions, tight timescales and harsh environments. For over 40 years, Cat Pumps has been the leading supplier in the vehicle wash industry. View more informaion on our complete line of car, truck, bus and mass transit wash equipment. Cat Pumps products are widely used for the agriculture and food processing industries in several applications like sanitation, misting, conveyor belt cleaning and more. Steel-making, metals machining, production processes and many specialised OEM equipment designs need robust pumps to generate high pressures reliably and economically. Cat Pumps products can be found pumping aggressive chemicals, in adverse operating environments and in applications requiring the critical control of flow rates and pressures. Cat Pumps products are common installations in water, environment and waste markets. Our products are built to be reliable in even the most demanding applications.